This entry was posted in Airsoft and tagged gameplay, rules, scenario. Bookmark the permalink. Buckets and ropes roflmao. Ever heard of chess clocks? 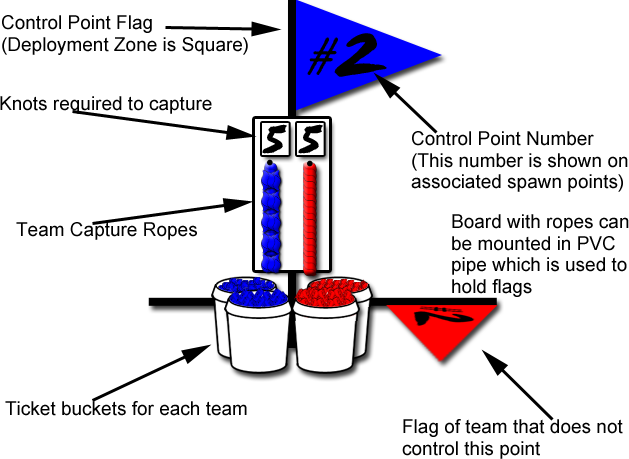 https://furluge.com/2011/01/15/alternate-control-points-for-airsoft-conquest-scenarios/ was written write after this one and it’s done using stopwatches. The idea behind using the ropes was to keep costs down. All the chess clocks I looked at when I wrote this up were more expensive then I would like, and you would have to teach people to reset them for each capture. Ultimately what really killed this idea is I could never make it bone-headedly simple enough for use in a game.